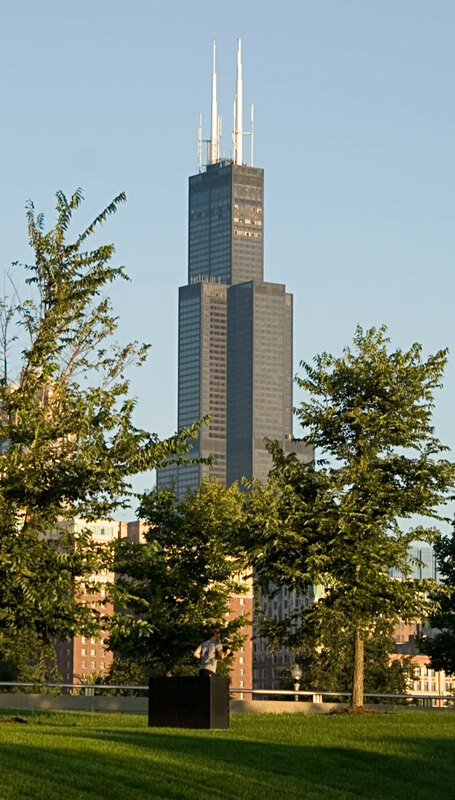 Willis Tower (formerly named, and still commonly referred to as Sears Tower) is a 108-story, 1451-ft (442 m) skyscraper in Chicago, Illinois. 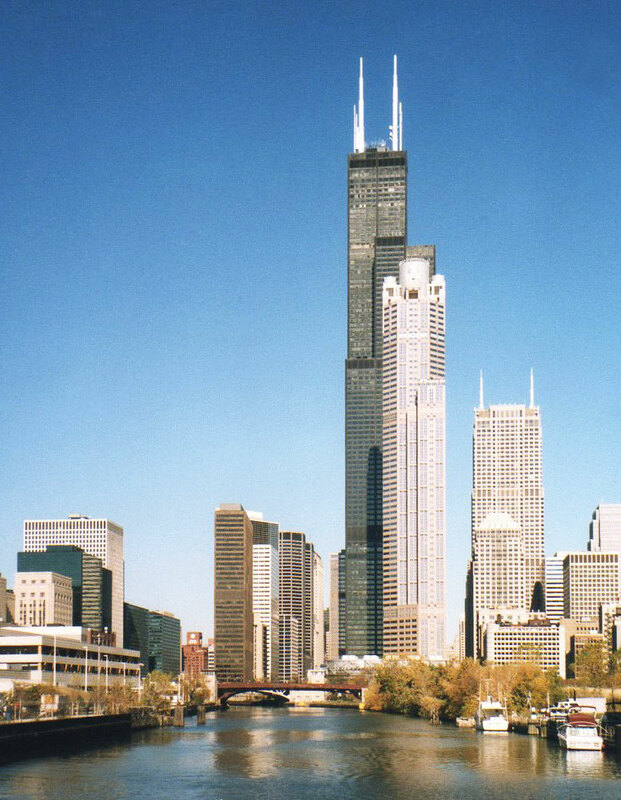 At the time of its completion in 1973, it was the tallest building in the world, surpassing the World Trade Center towers in New York, and it held this rank for nearly 25 years. 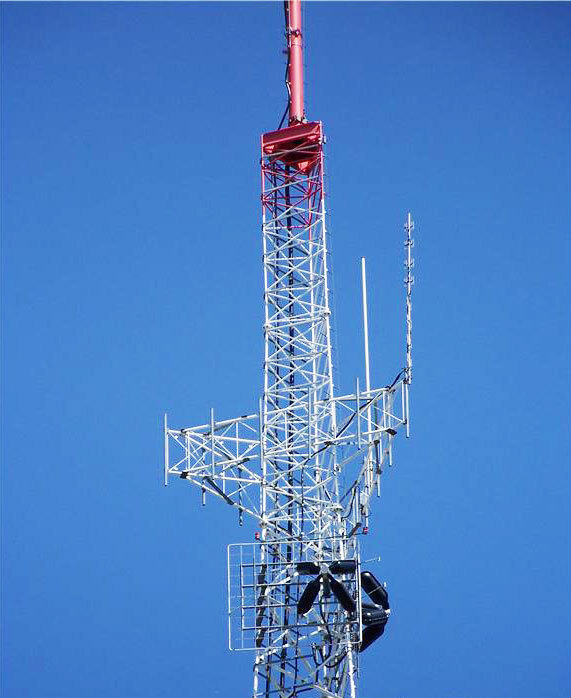 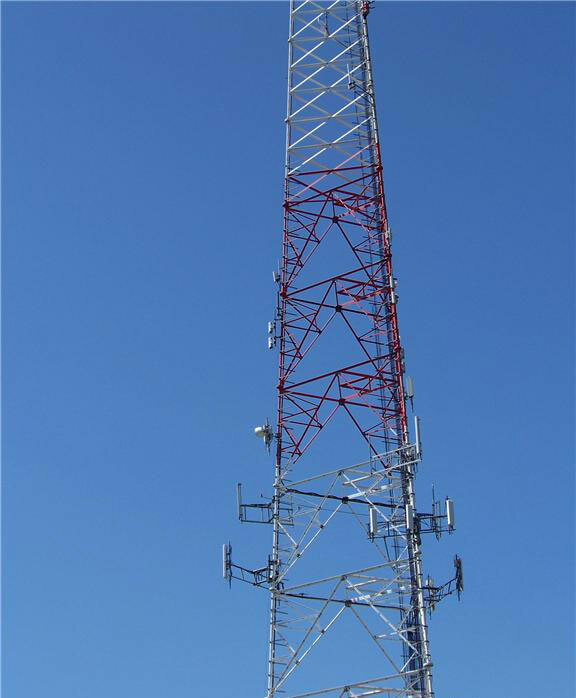 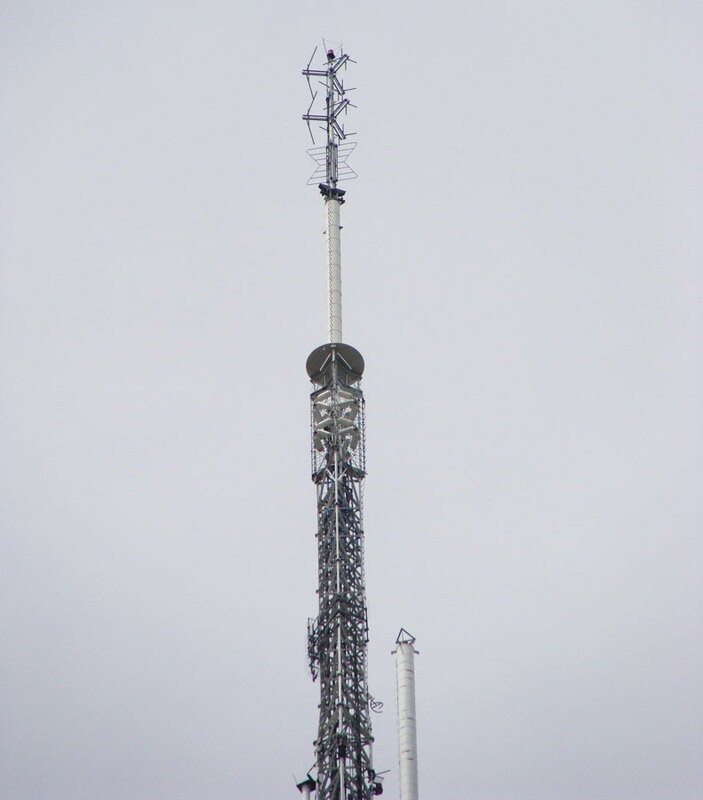 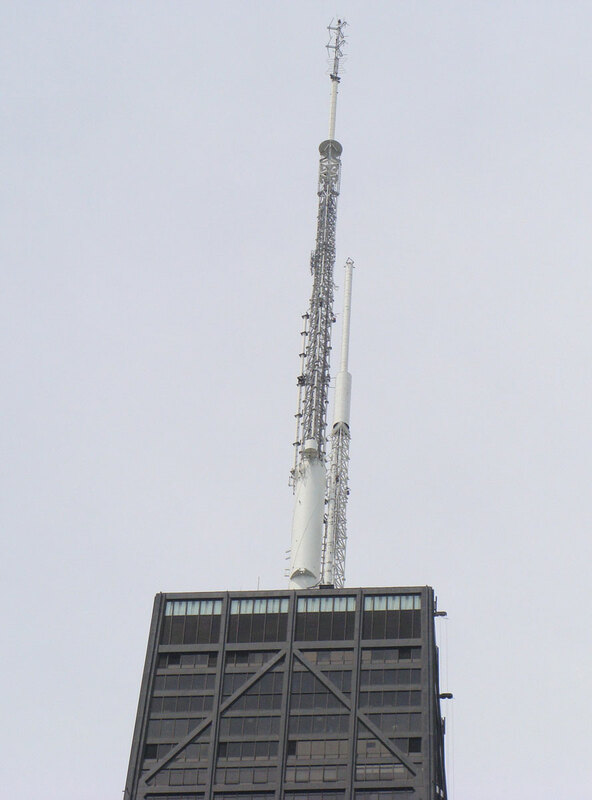 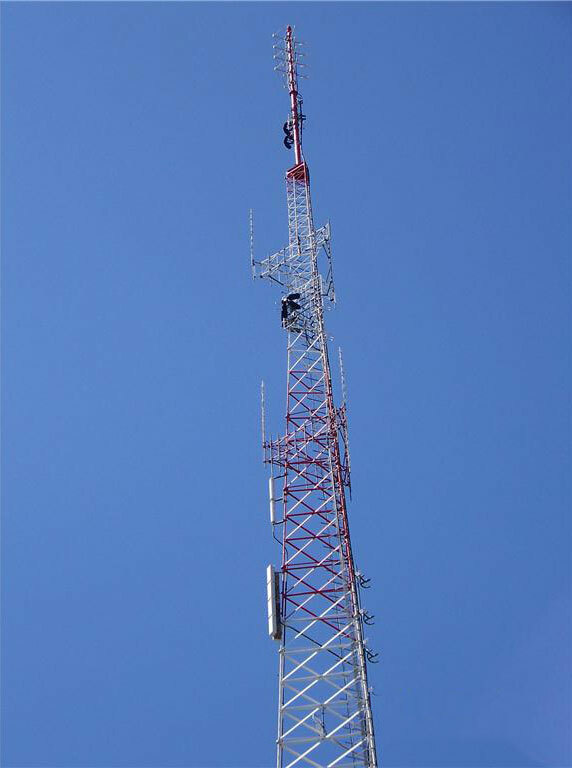 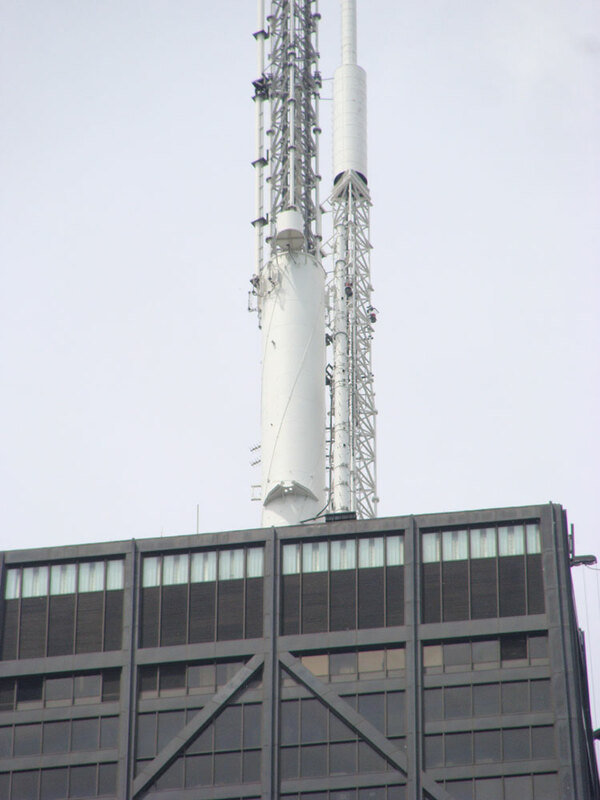 Many broadcast station transmitters are located at the top of Willis Tower. 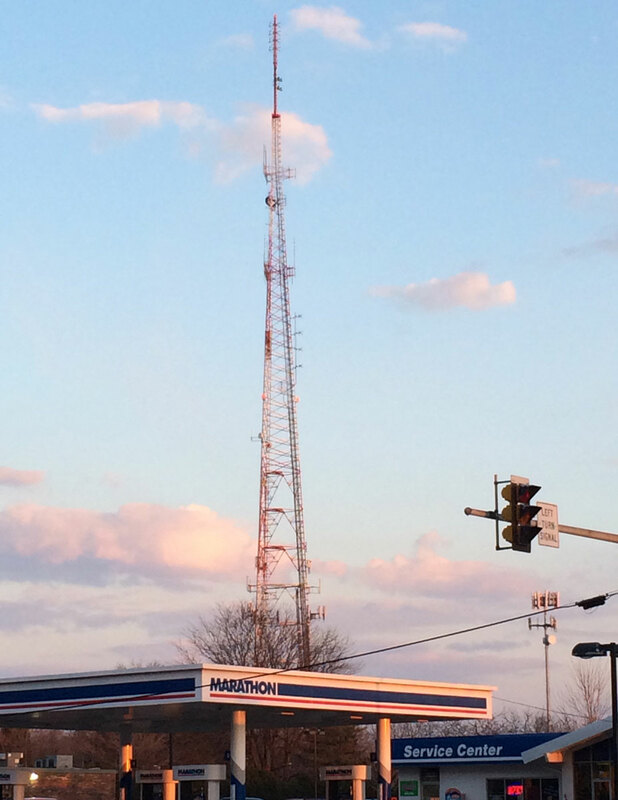 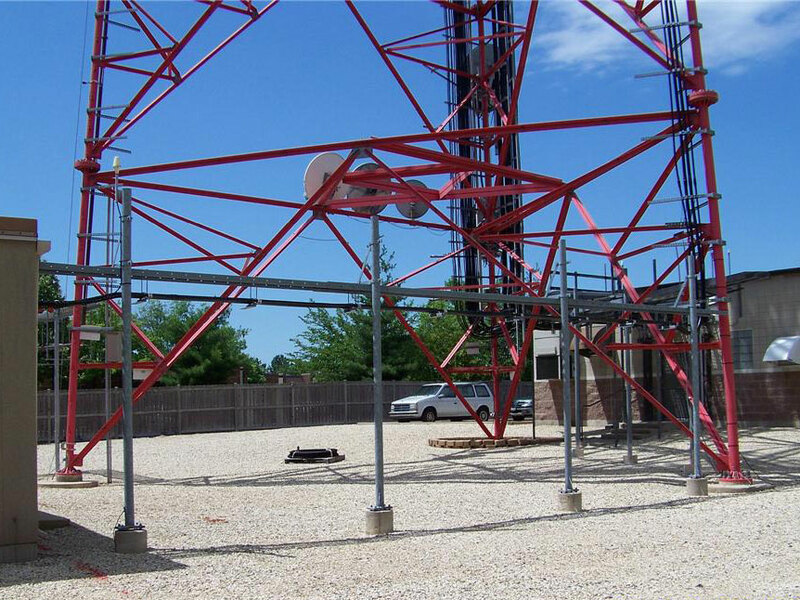 Stations are using diplexers to share the same antenna. 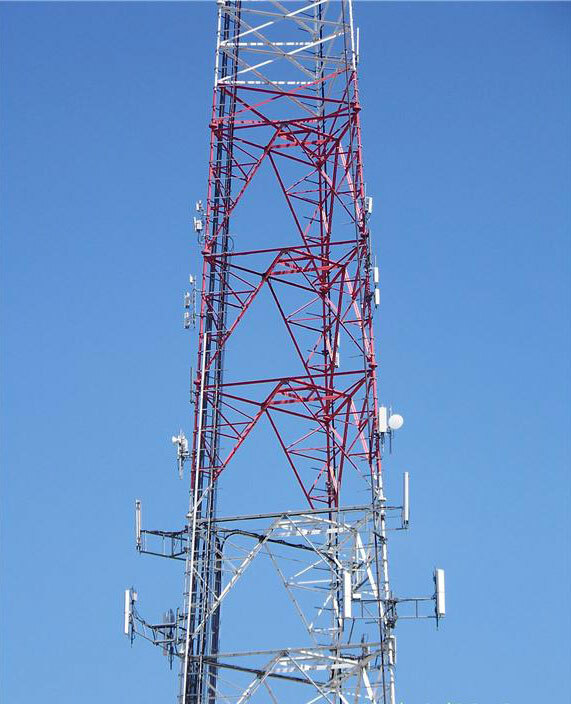 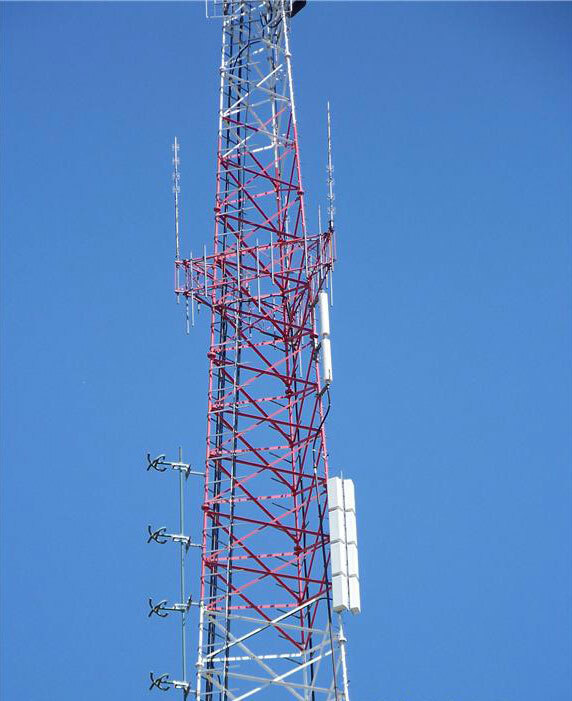 Due to its extreme height, FM stations (all class B) are very limited in power output. 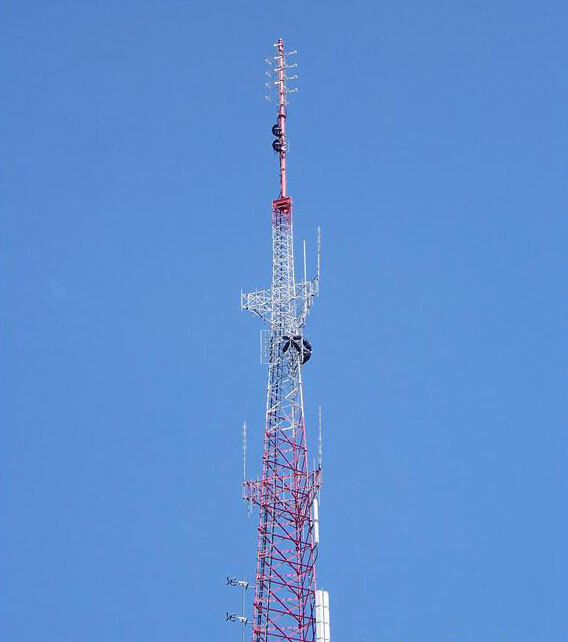 East antenna is 253' tall, West antenna is hihger in 30'; both have 12' diameter at base. 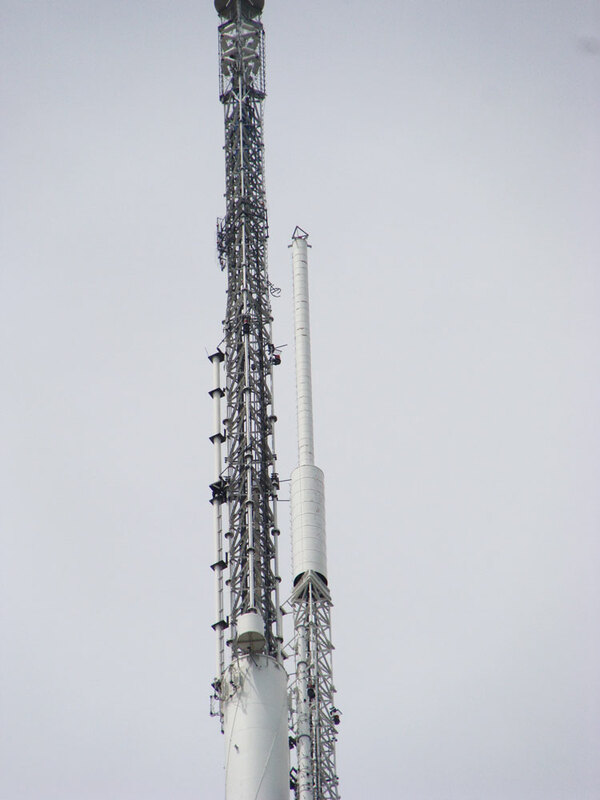 On top of each antenna there is a TLD (Tuned Liquid Dampener). 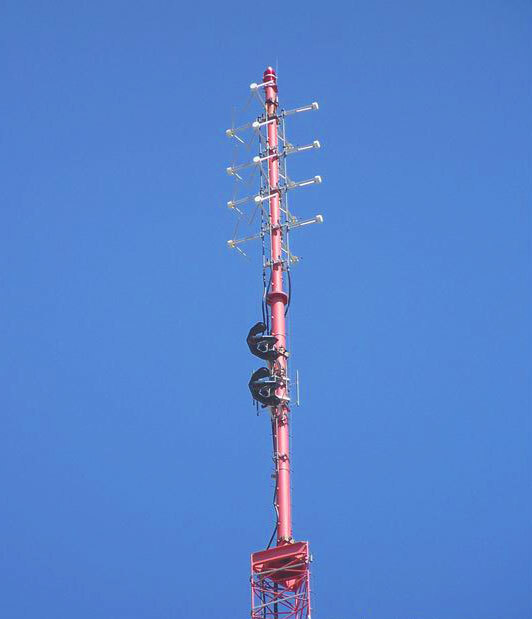 Its purpose is to counteract the sway of the antenna from the wind. 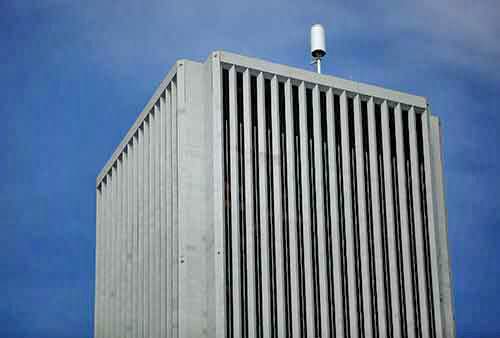 The airplane warning lamps blink 40 times per minute. 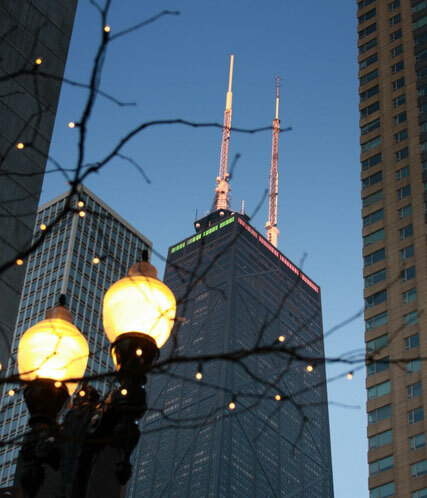 The night intensity level drops to one quarter of the daytime level at dusk. 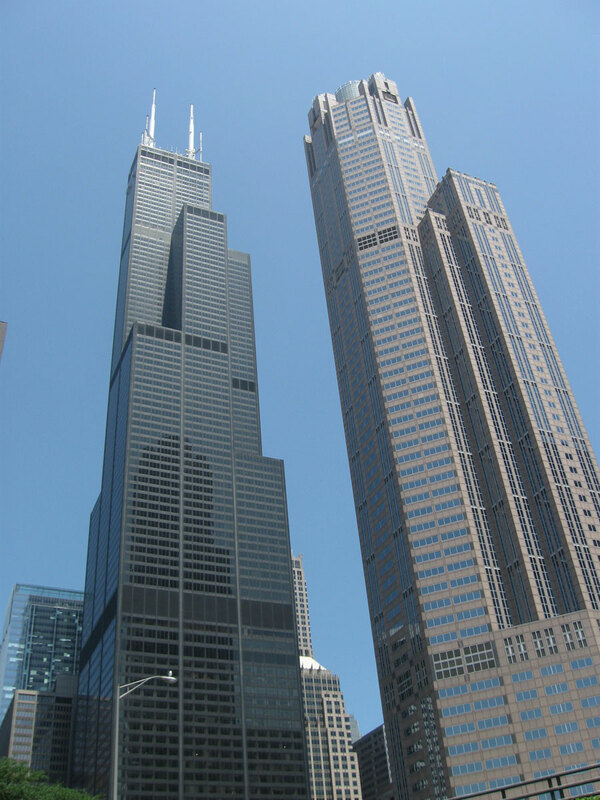 John Hancock Center at 875 North Michigan Avenue in Chicago, Illinois, is a 100-story, 1127-ft (344 m) tall skyscraper. 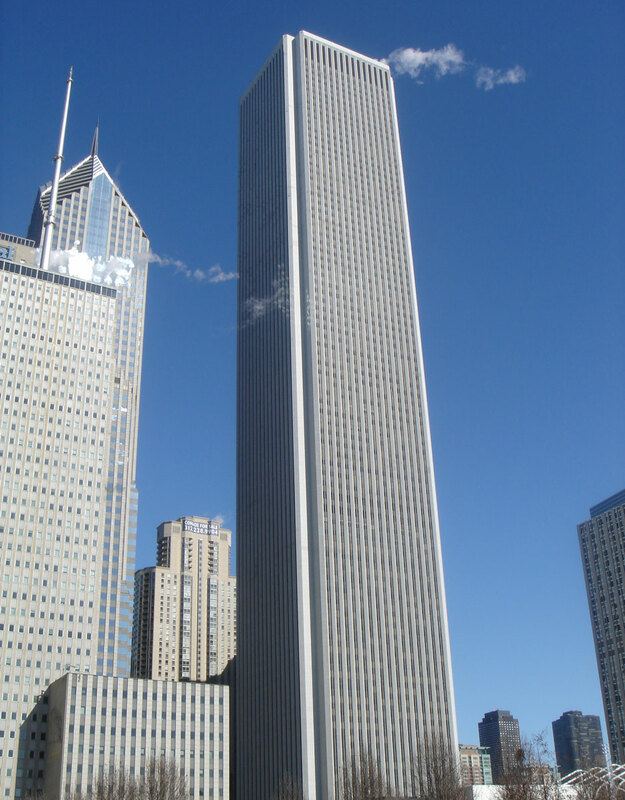 When the building was completed in 1970, it was the tallest building in the world outside New York City. 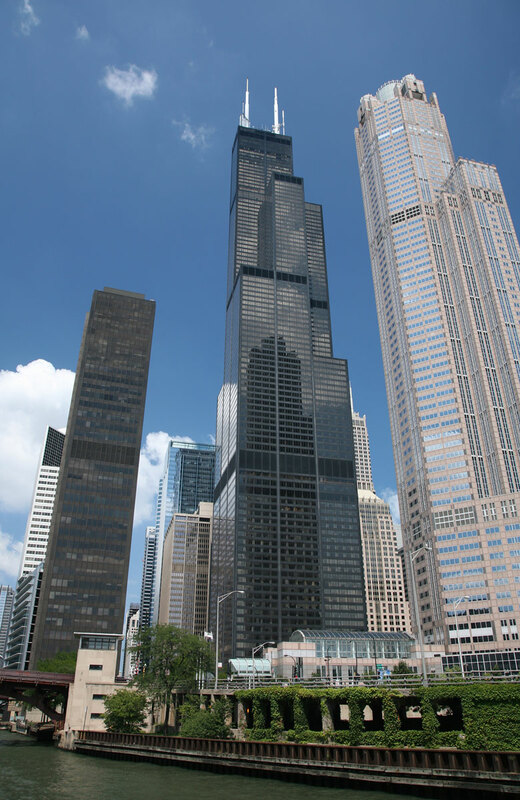 It is currently the fourth-tallest building in Chicago and the sixth-tallest in the United States and the fifth-tallest building in the world. 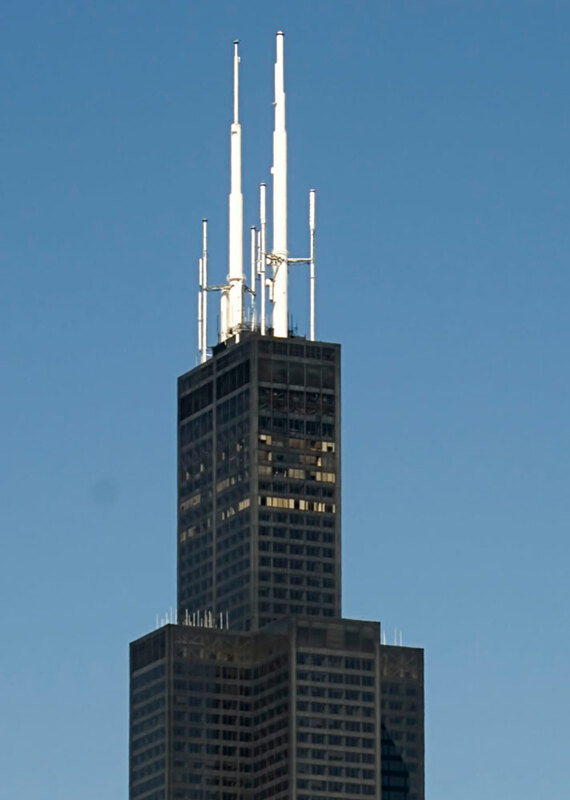 With a height of 1500 ft (457 m) including its antennas, the John Hancock Center is one of the most distinctive parts of stunning Chicago skyline. 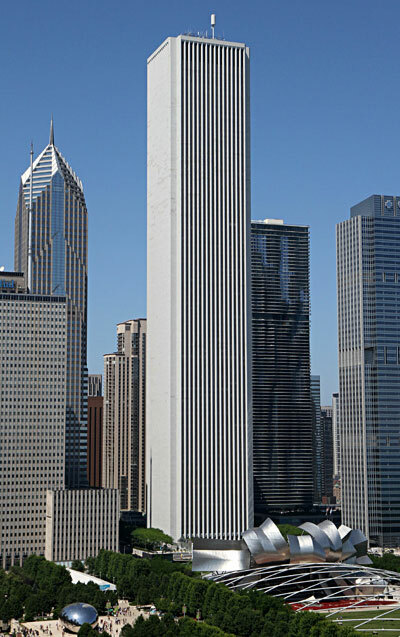 The Aon Center (200 East Randolph Street, formerly Amoco Building) is a modern skyscraper in the Chicago Loop, completed in 1974 as the Standard Oil Building. 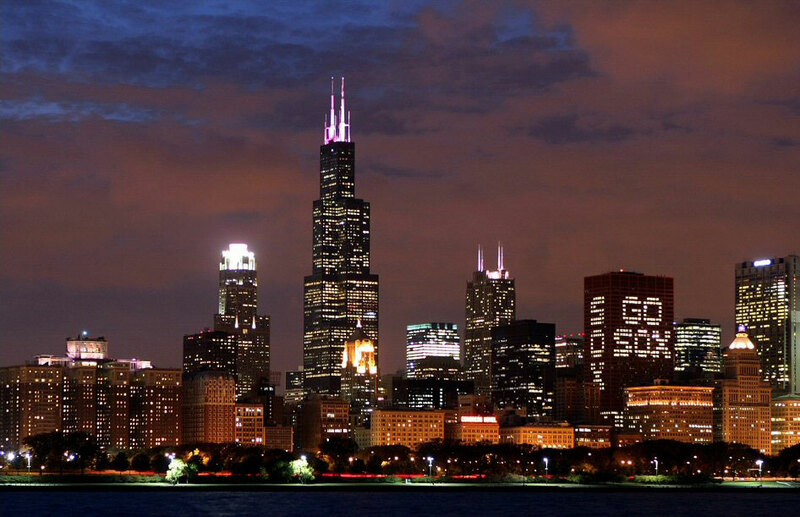 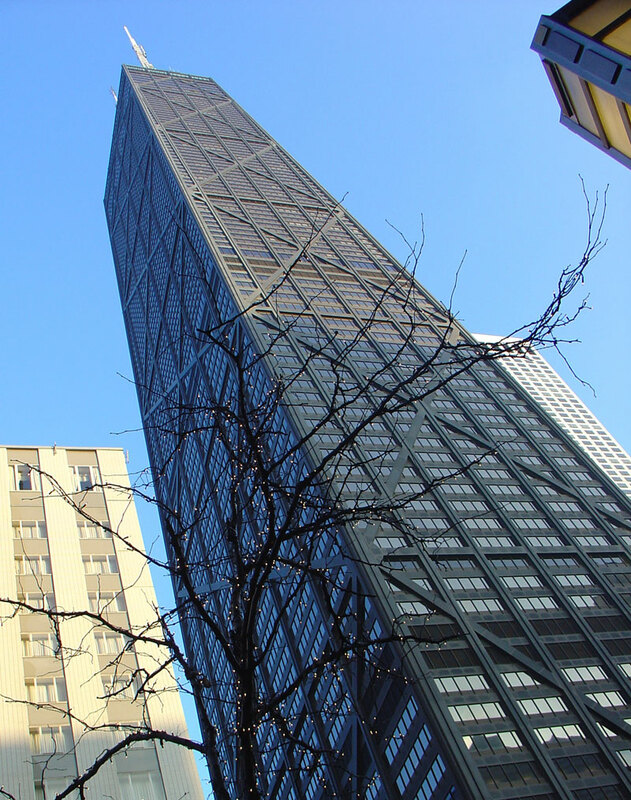 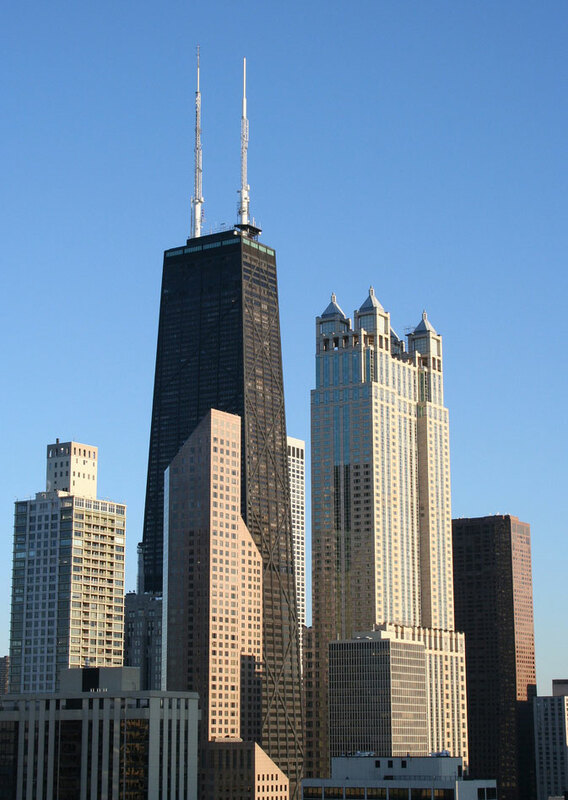 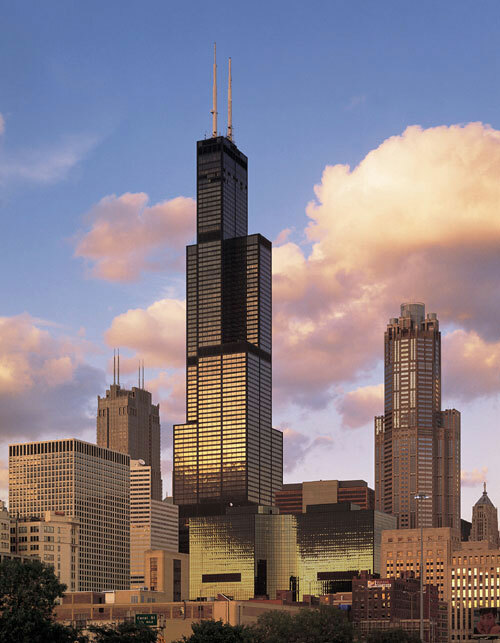 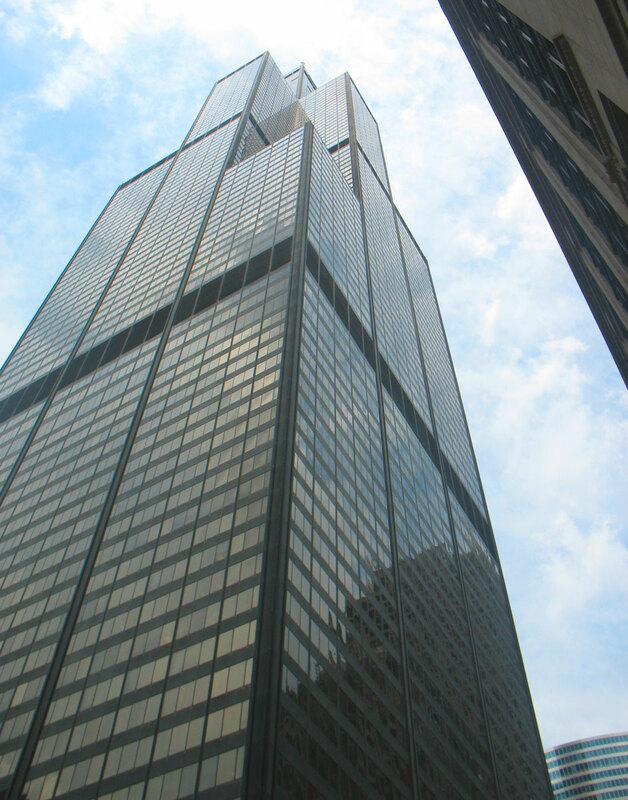 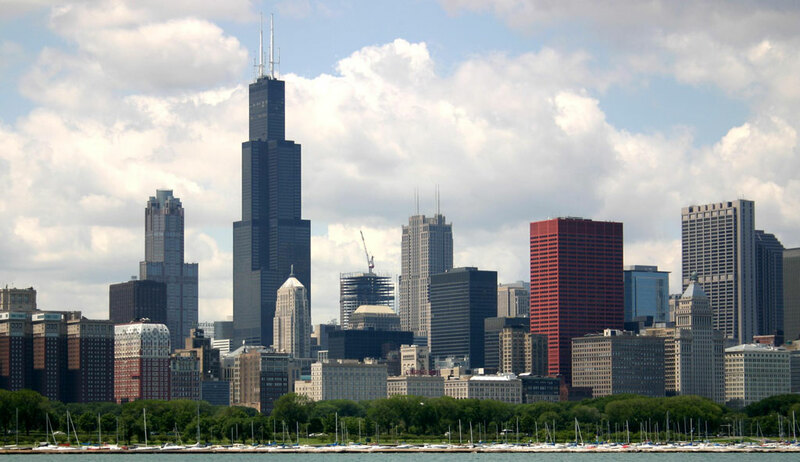 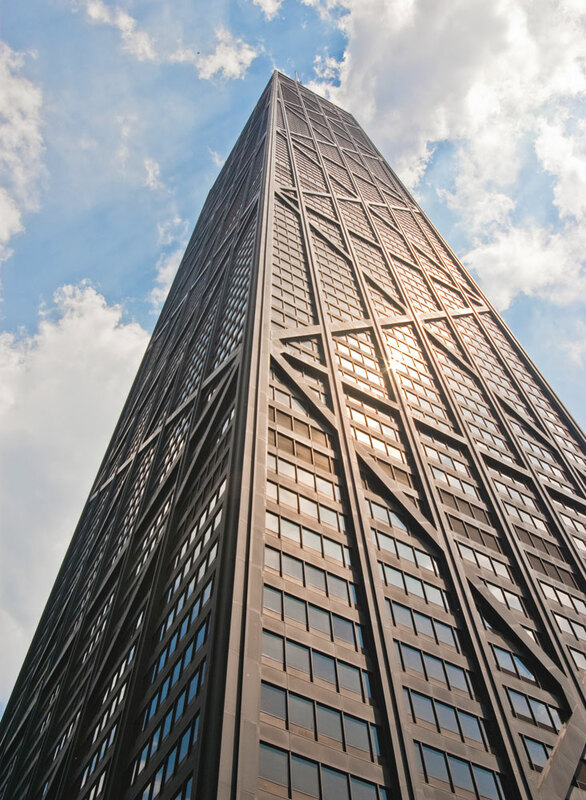 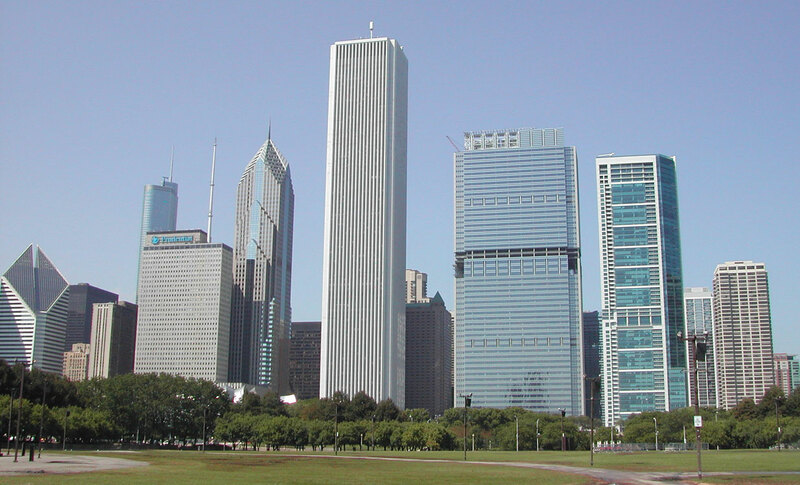 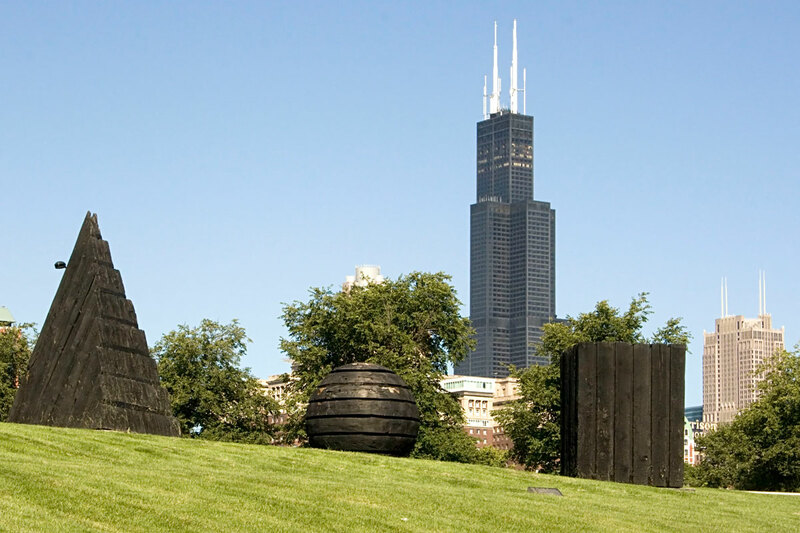 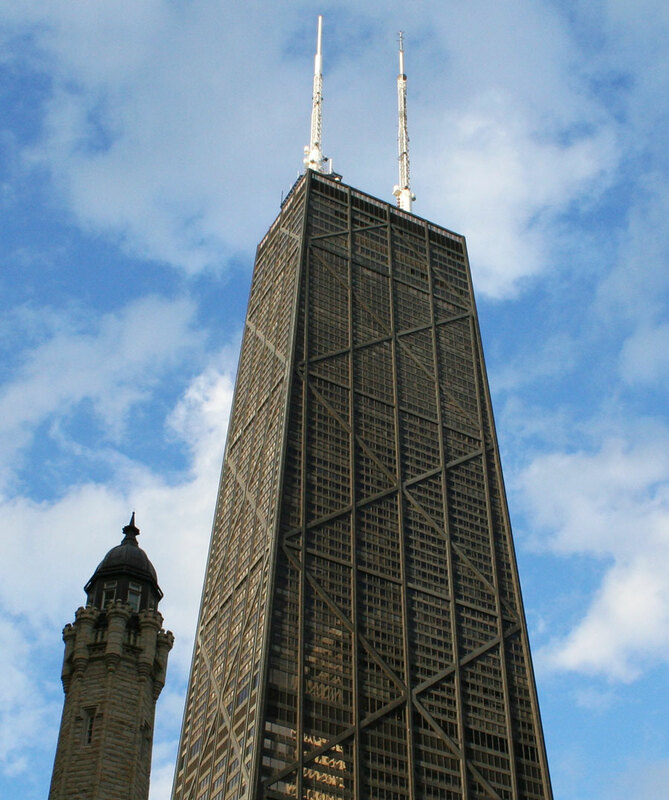 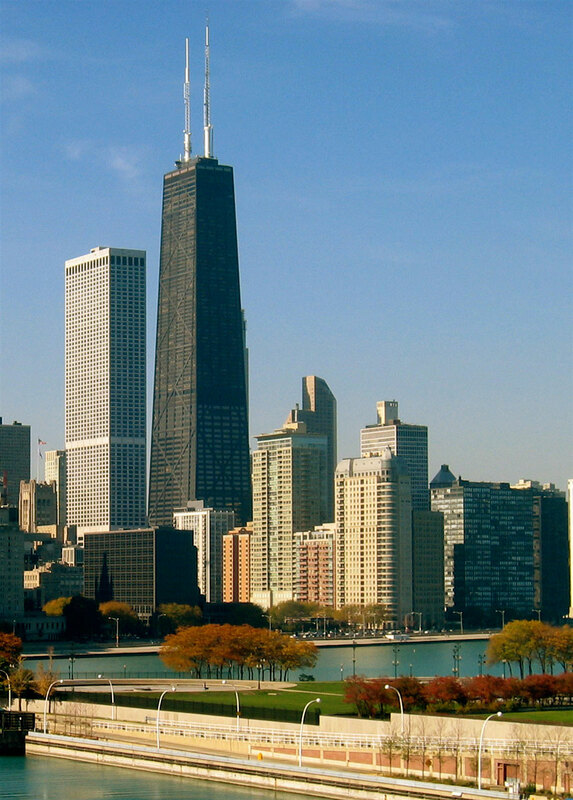 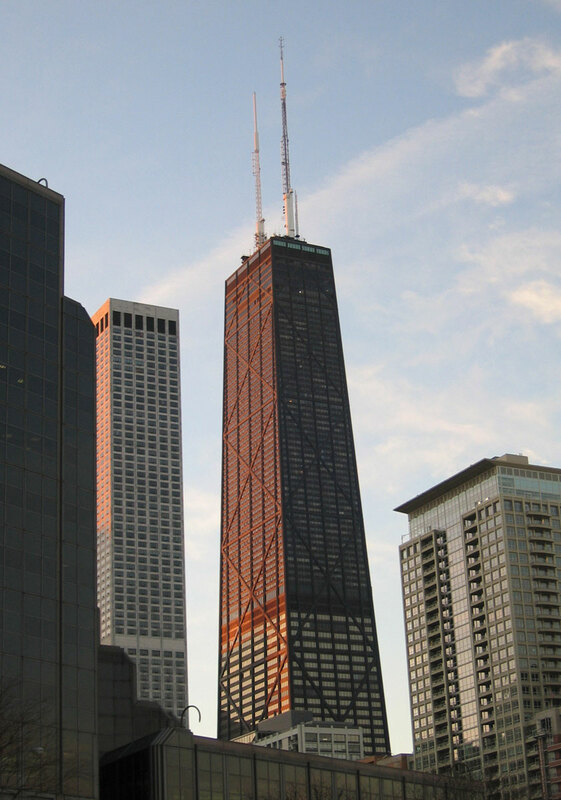 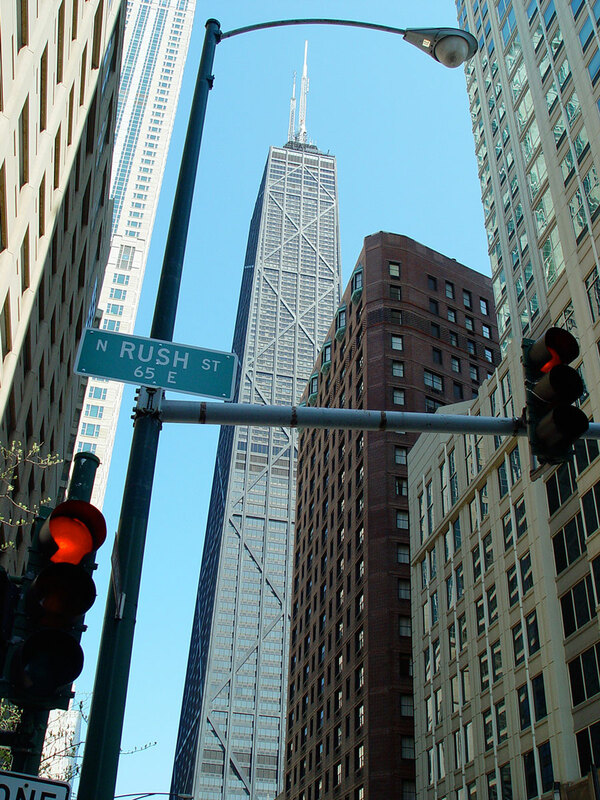 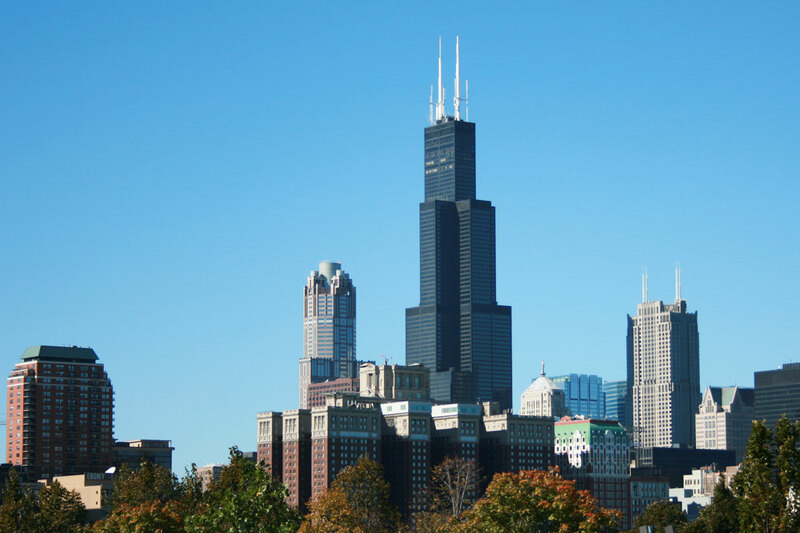 With 83 floors and a height of 1136 feet (346 m), it is the third tallest building in Chicago. 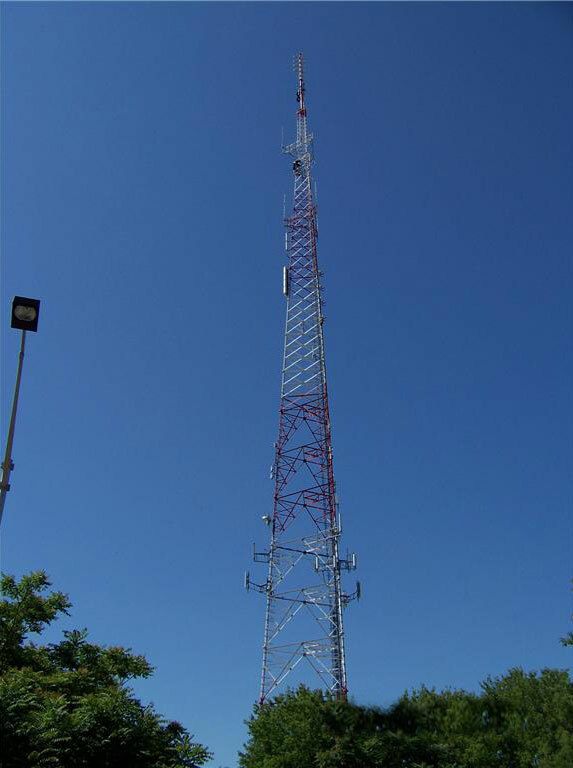 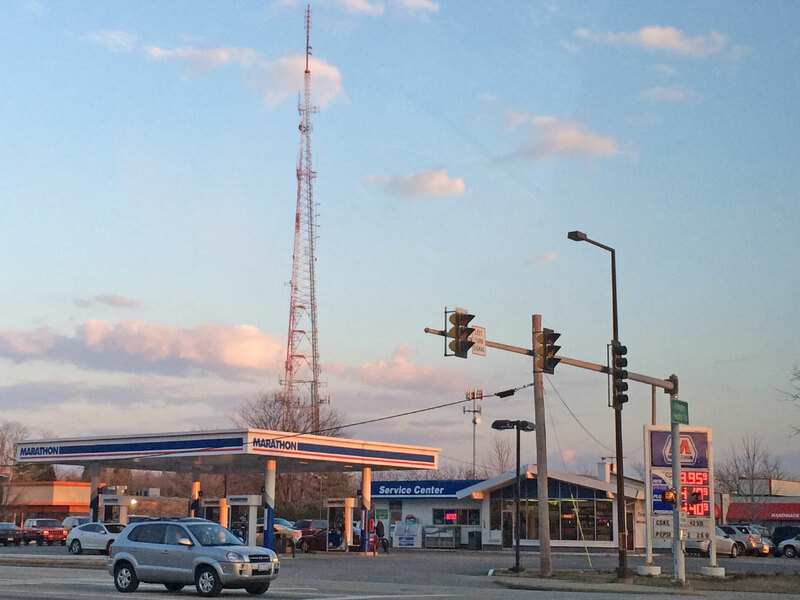 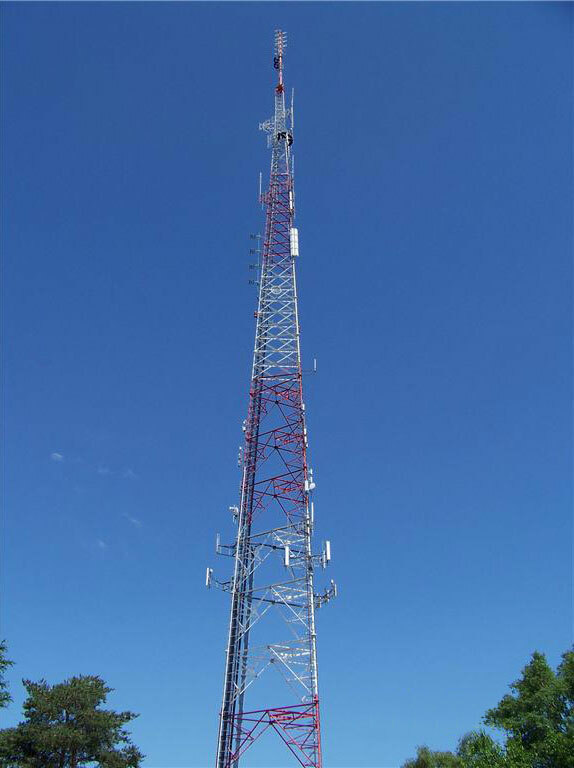 American Tower transmitter site is located at 129 West Boeger Drive in Arlington Heights, Illinois.